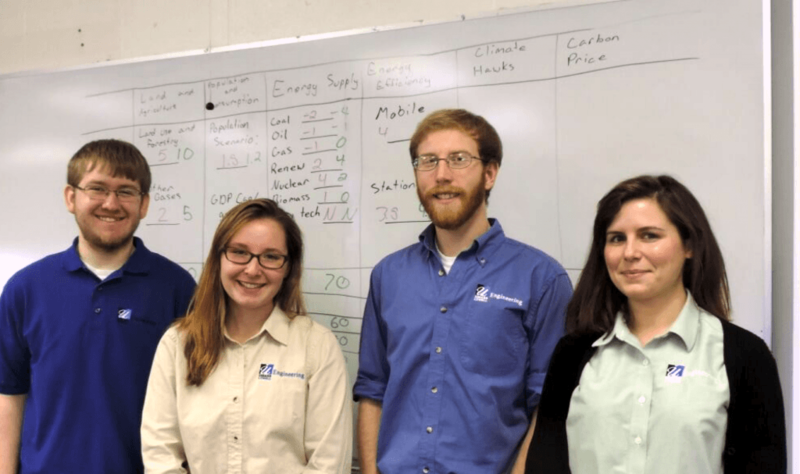 After a colleague led a training in using Climate Interactive’s role playing exercises, Professor Michele Putko ran with the idea and is now teaching her college engineering students to run the workshops themselves for high school audiences. Michele’s undergraduates have already reached 100 high school students at 3 different schools. This is tapping into a powerful reinforcing positive feedback loop that is driving diffusion. 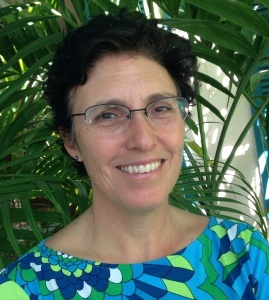 Michele first encountered Climate Interactive‘s World Climate Exercise over semester break in January 2014, when she attended a workshop for faculty hosted by her colleague Dr. Juliette Rooney-Varga. “I thought that World Climate was insightful, and it did not require extensive lecturing. You saw a lot of different aspects of the issue, all brought into one short exercise. And it wasn’t painful. It wasn’t one of these long lectures. It was fun and very informative,” said Michele. The more people that teach others to use our tools, the more people there will be who can teach others, and the impacts of this work will spread. Michele immediately wanted to bring the exercise to high schools in her area. 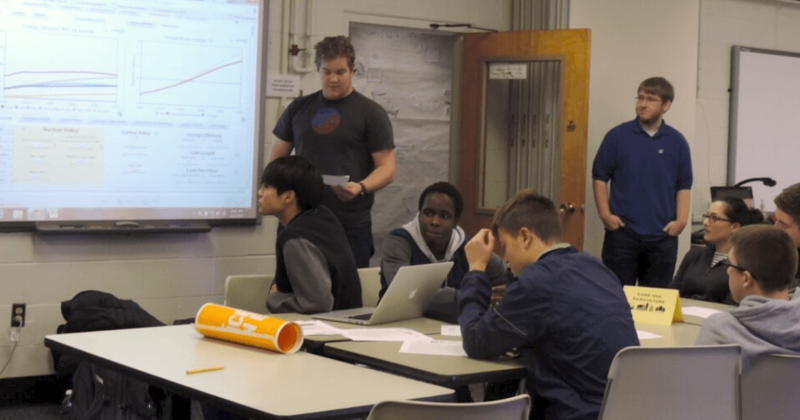 After she was introduced to the World Energy Exercise, she knew she had the perfect thing for her mechanical engineering students to engage in. Many of the drivers in World Energy are topics she was already covering in her lectures. 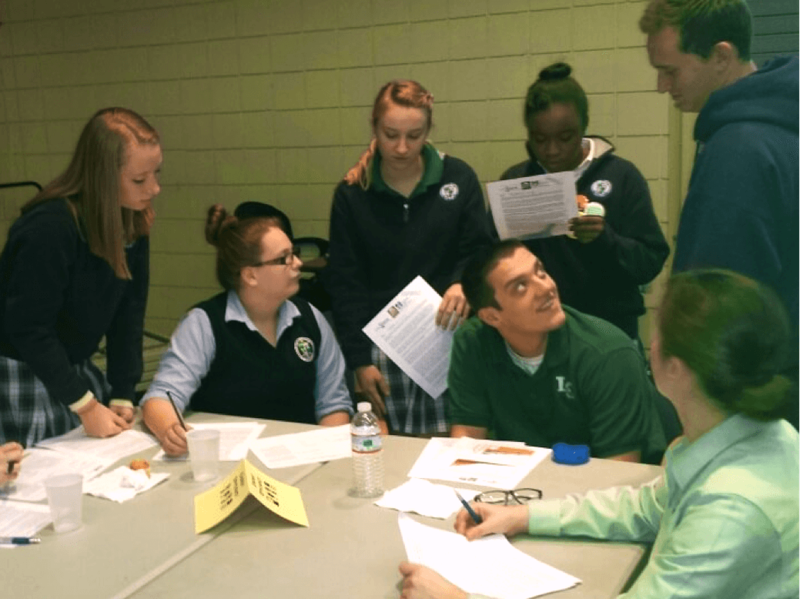 Six of Michele’s students volunteered to learn the exercise and make presentations at local high schools. Michele led her students through a crash course in climate change issues to prepare for their World Energy events at local high schools. They studied topics such as: What are the different types of greenhouse gases and how do they effect the world? How do we measure them? Where do we measure? It was a steep learning curve, but her students rose to the challenge. 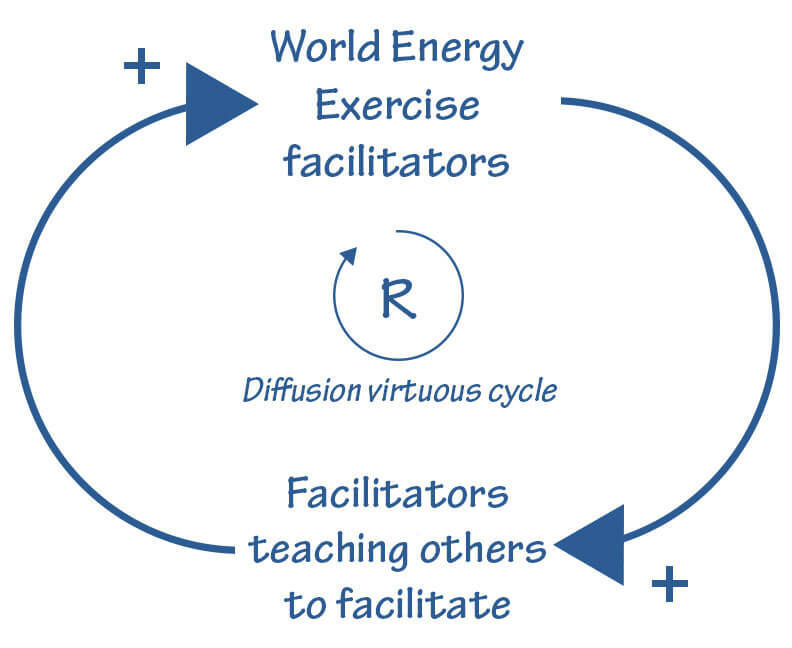 Why do you use the World Energy Exercise? It is a very concise way to bring out a lot of different and complicated aspects of climate change. I think it allows participants time to digest the information, and everyone has the opportunity to learn something different – some people may relate better to a certain aspect more than others. It really is a very holistic approach and very much all-encompassing. And, it’s not painful – it’s fun and it creates curiosity. Why do you keep running the World Energy Exercise? In my mechanical engineering senior course called Design of Thermal Fluid Systems, one of the things students do is design a fossil fuel power plant that will make electricity. Before this, we’re going to start with World Energy, so now this whole power plant design won’t just be about the dollars made, but they’ll be thinking about all these other things – about the carbon emissions, mostly. As part of the design, I impose a carbon tax, and then we look at the different benefits of using different fuels. I think having a background in World Energy will really change people’s viewpoint. Engineering curriculums are so packed with requirements, that it can be a challenge to fit climate change in, but it fits so well. We’re expanding the technical to get in the political and socioeconomic aspects as well. What is unique about this tool? 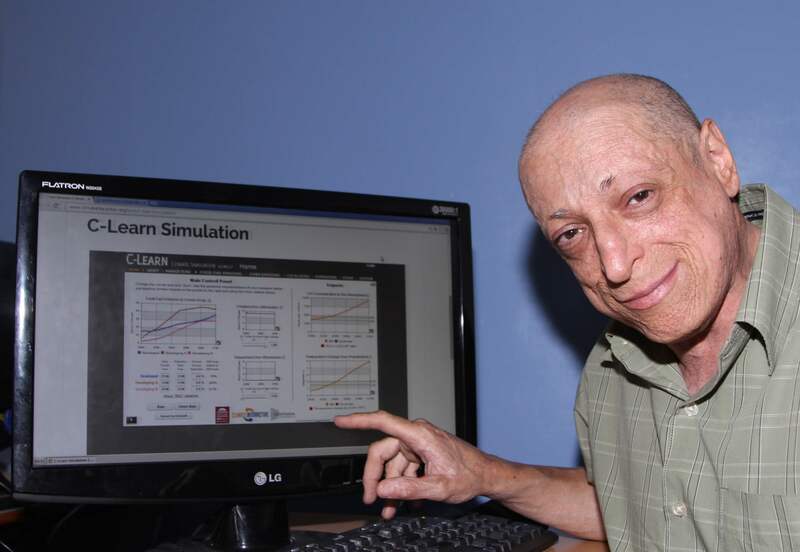 I think it’s very interactive, from group to group, as well as with a sophisticated computer model. The teams that are represented (Land Use, Population, Carbon Pricing, Energy Efficiency, etc.) present a unique set of influencers and stakeholders – it shows you just how complex the issue is. It doesn’t trivialize the issue, but I don’t think it’s overly complex. I think it’s just that right mix of interaction in groups, and the group dynamics seem to be manageable but a little chaotic so the students get the sense that this is a big messy problem, not a nice concise, well-defined problem. How do you feel leading up to hosting World Energy? How do you feel after? Thankful that we did it. It’s rewarding, and we feel recharged. What emotions do you see in participants? I think a lot of them are surprised. And perplexed. Some are pensive. At the same time, I think they are having fun – there is a lot of smiling because of that peer interaction and role playing. I think everyone learns something, and perhaps they show their emotions differently. What is your favorite moment running World Energy? One of the six students I trained went to the People’s Climate March last September in New York City, simply because I told him about it and he was interested. I realized World Energy was impacting a lot of the students’ decisions. One of my students wanted to be an engineer, but after running World Energy, she told me she wanted to work in the renewable energy field. It’s changing people’s long-term decisions and short-term decisions. It’s not just learning, it’s influencing people’s actions. Does any moment stand out as an “aha” moment? When they realize it takes everything, a full effort, from many different aspects of society, to really influence the outcome.